Spin implies angular momentum which implies torque existed at some point. However the electron appears to be a perfect sphere. How can torque be applied to a sphere? Particle spin is not the same as angular momentum. The spin of an electron is a relativistic phenomenon. It is related to angular momentum but has nothing at all to do with the electron actually rotating about an axis. How is it related to angular momentum? Does torque still change angular momentum at the scale of electrons or is that only a classical phenomena? That's what's taught Dan, but I think it's wrong myself. See the discovery of electron spin and note this: When the day came I had to tell Uhlenbeck about the Pauli principle - of course using my own quantum numbers - then he said to me: "But don't you see what this implies? It means that there is a fourth degree of freedom for the electron. It means that the electron has a spin, that it rotates". And look at the Einstein-de Haas effect which "demonstrates that spin angular momentum is indeed of the same nature as the angular momentum of rotating bodies as conceived in classical mechanics". And the electron has its magnetic dipole moment. Because there's a real rotation in there. For myself I think there's the most god-awful non-sequitur that has taken root. The electron can't be spinning like a planet, because it would have to be spinning faster than light. So people say it can't be spinning at all. But it can. It can be spinning like a Dirac spinor which "is the bispinor in the plane-wave solution...". The bispinor that comes from the Dirac equation simply represents two spin 1/2 particles so we may as well talk about a single spinor. I am curious...where do the geometric constructions of a spinor come from? I've never heard of modeling particle spin on a torus. Last edited by topsquark; Sep 28th 2014 at 09:12 AM. The reason I was taught (and understand the best) is that the spin 1/2 nature of the electron means that it would have to go around twice to make one complete revolution. That is why particle spins cannot be physical rotations. I struggle with this, in that Dirac's belt is where "a Mobius strip is reminiscent of spin-1/2 particles in quantum mechanics, since such particles must be rotated through two complete rotations in order to be restored to their original state." A Mobius strip is nothing special. I just can't see any reason why the spin can't be physical. It's just a "smoke-ring" rotation and a "steering wheel" rotation combined. And yet this article is typical, and says "spin is something very very weird". How can it be weird? Pair production isn't weird, it's just physics. I refuse to be fobbed off with weird. IMHO the lifetime of ~4.5×10^−24 seconds is the issue here. It takes time to physically rotate at the speed of light, and this lifetime really doesn't allow for much. And I have heard that it arguably goes back to Thomson and Tait, who proposed "vortex atoms" before anybody even discovered the electron. Here we go, see On Vortex Particles by a guy called David St John. And see this on Wikipedia: "In 1867, William Thomson (Lord Kelvin) and Peter Guthrie Tait introduced the solid spherical harmonics in their Treatise on Natural Philosophy, and also first introduced the name of "spherical harmonics" for these functions." 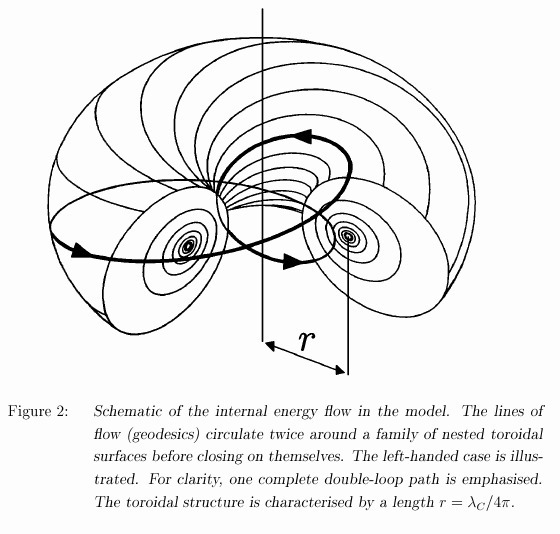 There's such a thing as toroidal harmonics too, and TQFT is all to do with know. But all this stuff seems to be totally marginalised by the Standard Model, it just doesn't feature. Last edited by Farsight; Sep 29th 2014 at 08:45 AM. Ok, I am going to try and get some feel or intuition of the geometry here by asking some questions. 1. How big is the torus shape compared to the diameter of the electron? 2. Does the torus represent the electron trajectory or the shape or something else? But note that the above is merely "the eye of the storm" as it were, the thing in the middle of the spirals below. Also note that it's quantum field theory, the electron's field is what it is. The electron isn't some billiard ball thing in the middle that has a field, field is all that's there. We might depict it as something like the frame-dragged gravitomagnetic field like this, but there's no outer edge or any point where it stops. Something else. It's like the inner portion of a photon trajectory. Call it "field structure" or topology, check out TQFT. 3. What experimental evidence is there for an electron turning 720 degrees before the same side is facing? That's totally mainstream. See for example hydrogen fine structure on hyperphysics. I'm not sure what you mean. But if it helps at all, there is something akin to frame dragging. Think of a 511keV photon as something like a seismic wave to understand why it takes many-paths. It isn't some billiard ball thing. And when after pair production it follows a Dirac's-belt closed path, we don't call it a photon any more. Last edited by Farsight; Sep 30th 2014 at 04:24 AM. Spin implies angular momentum which implies torque existed at some point. However the electron appears to be a perfect sphere. How can torque be applied to a sphere?